What's not to love about a bicycle? Or in the beginning for most of us it was probably a tricycle. I went trawling through the old photo albums and managed to find a few pics that reflect the joy (and trepidation) that comes with owning and riding a bike in the backyard - complete with picket fences of course! 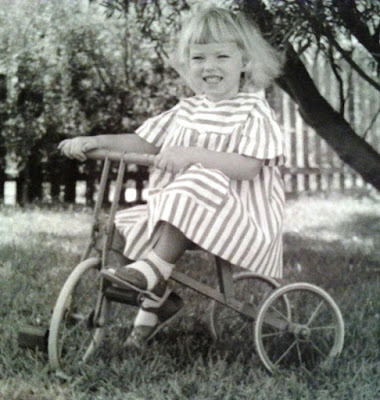 Here's me on my first tricycle - a little (second hand of course) pink trike with wooden handlebars. I'm probably about 3 years old here and look how proud I am to be pedalling under my own steam. Kids' trikes have come a long way since the 1960's but it still did the job back then and I'm obviously enjoying it. 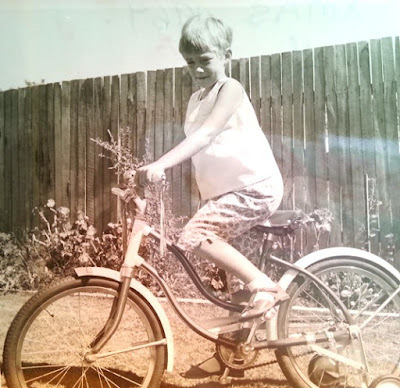 And here I am at 5 learning to ride my first bicycle - it even has trainer wheels and you can see how concerned I am at trying to get it right. You can also see the DREADFUL haircut that my mother thought was cute - she tells me it was a "pixie cut" - all I can see is a hack job and I truly wonder what my mum was thinking at the time! I fell off this bike once when I was zipping around a corner near a new house and there was loose sand on the road. I managed to bash my hand on the ground and had to get patched up by a lovely neighbourhood mum who saw me hit the ashphalt and came to my rescue. And here I am on my new bike - this was taken a couple of years ago when I quit my job and started thinking about what I'd like to do - one of the things on my list was to get a bike - and the style that's popular now really suited me - complete with cat carrying basket on the front! I have to admit that it hasn't had as much use as I'd planned, but I still love it and I'm glad I re-discovered the joy of bike ownership. The other type of "Last" bike that I've been enjoying is this one. 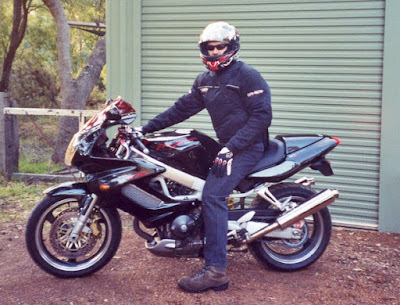 My husband decided he wanted to get his motorbike licence and then bought a big 1000cc Honda motorbike. I don't have any desire to learn how to ride it, but I do enjoy being a pillion passenger occasionally - hanging on for grim death as we zoom down the highway and stop somewhere along the way for morning tea. We fell off this bike once too - when a 4 wheel drive owner didn't see us and turned in our path - my life flashed before my eyes and I realized I wasn't quite ready to meet my Maker - I wrote about it HERE if you want the gorey pictures. Fortunately it wasn't the end of our story, or the end of our biking - but we were a little bit wiser and more cautious from that moment onwards! Do you have a fond memory of your first or last bike? Do you have stories of falling off and surviving? Are you a motorbike enthusiast? 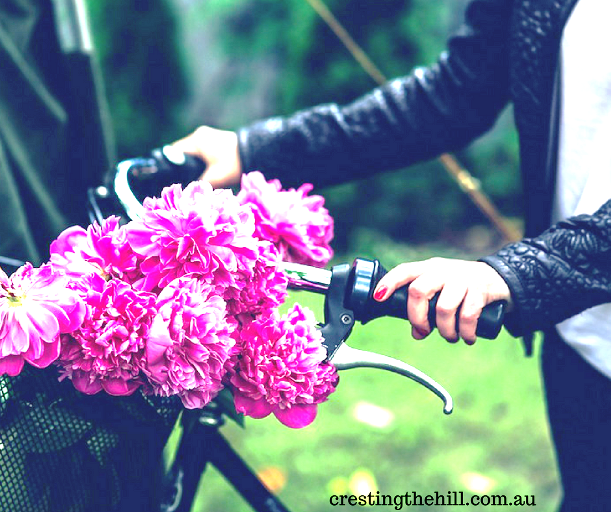 A lot of Midlife women are getting their bike licences and discovering a whole new chapter of life - very inspiring examples of what you can do if you feel the "call of the wild". It was a pixie cut and done by a hair dresser, not me. If the style is good enough for Ellen DeGeneres and Audrey Hepburn, it should have been good enough for you! I don’t know, KIDS!! P.S. A 75 year old lady arrived at our ladies Red Hat Society lunch riding her motor bike and wearing red leathers top to toe. There is life in us old dogs yet! I'm still wondering what that hairdresser was thinking!! Anyway I've moved on after 50 years and only feel slightly damaged by it :) I'm very impressed with the red leathers and the motorbike riding of that 75 yr old - does she have a purple helmet for her birthday rides? What fun memories! 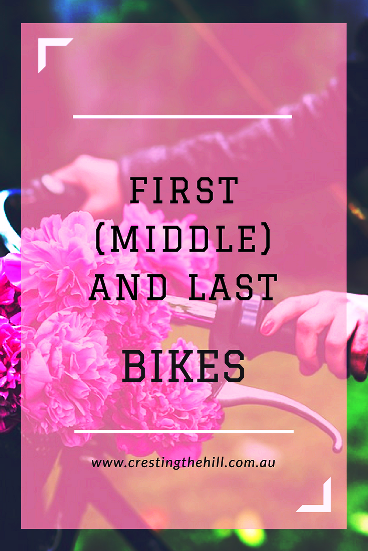 I remember all my bikes, but I'm especially fond of the one my husband bought me a few years ago. I hadn't been on a bicycle for years, but he took me to the shop and told me to take a test ride. I felt insecure and unstable, but it's as the old saying goes: It's just like riding a bike; you never forget. I have had some wonderful rides on it. Every time I get on, I feel the same sense of child-like freedom. Thank you for the reminder. I loved buying a bike that was more "me" this time Melody - the little basket on the front makes me smile and is actually quite useful. Because I've developed arthritis in an ankle I broke a long time ago, I decided to get back into bicycling. It makes my ankle feel better. So I just bought a new one. My last? Who knows! I love that bike riding gives us exercise but is fun to do at the same time and glad that you found you could still do it with a bad ankle. I was thinking just the other day that i'd love to have a bike again. We used to have bikes with long handlebars. They were fun. I had a 10 speed but thought it was uncomfortable and sold it years ago. I love the bubble tire old fashioned bikes. They're cool. I like that you sit up straighter with this type of bike Rebecca. I'm tall and I used to find leaning over to ride quite uncomfortable. Like Carla, I remember my 'banana seat' bike the best. Like Shari, I'm not sure that my current bike will be my last (I sincerely hope that it's not)! And I LOVE the comment from your Mom. Great post, Leanne! 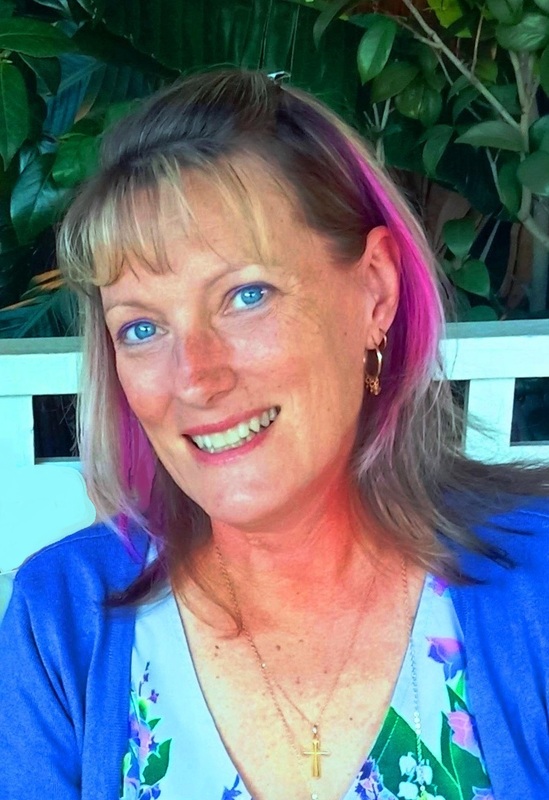 I remember riding my bike to my girlfriend's house when I was a teenager too Kathy - it was the only way to go back then because parents weren't the taxi drivers that they are today. Until I started high school my bike was always my most treasured item. All of the kids in our neighbourhood had bikes and we went so many places on them. Tidying out the garage a few weeks ago I uncovered my adult bike which has been stored away for a couple of years after being diagnosed with Plantar Fascia. Now that I have a management plan for the foot, it's time to get on the bike once again. I lived over the road from my primary school so I could walk every day, but I certainly needed that two wheeler to get to see my friends afterwards. The question is - did everyone pull out their phones to record your ignomy for posterity Jo? Or did you manage to escape unscathed? What a totally fun post Leanne!! My hubby and I started riding bikes again a couple years ago, but got out of the habit soon after. When I was growing up, my grandparents owned a bike shop, and I even had a unicycle. Those are great memories!! I would love to see a picture of you on that unicycle Jodie - and I bet you wouldn't stand a chance trying to balance on it these days! I actually gave my daughter a haircut like that when she was about three. I was going for what you had, but it turned out like a mullet and I had to schedule an emergency repair cut for her. I'm assuming the bike has put an end to your gym woe? I'm also inspired to get out on my own bike before we get twelve feet of snow every other day and live in the NH mitten again. Hi Susan - please pass my sympathies on to your poor daughter - at least you had the hairdresser rescue her before she was scarred for life :) And no, the bike doesn't get ridden fast enough or far enough to get rid of all those midlife calories unfortunately! I forgot about my tricycle. I was thinking of my first actual bike, but guess that was my second. It's the one I remember most however. We have a recording (from when I was 9 or so) and my father mentions that my brother painted my bike green for me as it was my favourite colour. From memory it was painted a very lime green!!! Maybe it will be something to buy with all that spare cash from the full time job Deb? You can ride it when you're back to being a part-timer again. I bet you don't choose a lime green one though! Yes a back seat makes more sense than a back "side" Min - and the bruised leg got me a lot of sympathetic noises from others while I had it! I'm certainly more tentative when I get on the back of the bike now than I was when we first got it! You manage to turn all your pastimes into exercise opportunities Deb - I bet you have a mountain bike with at least 10 gears! 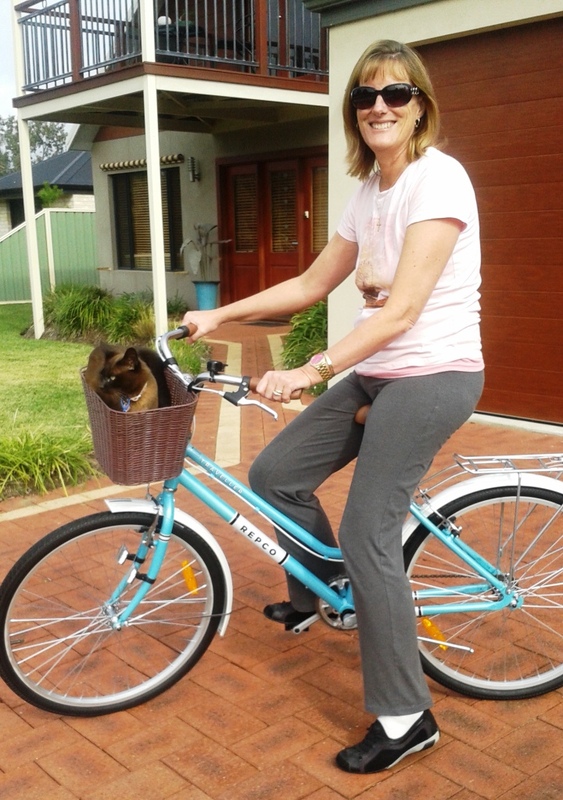 I just tootle along on mine around the neighbourhood - which explains why I don't lose any calories when I ride it! A RED SPARLKLY DRAGSTAR Leanne! My 10 year old self is exceedingly jealous of you! I would have killed for a bike like that instead of a sensible Malvern Star! And yes I totally understand that bike seat issue - it's not so bad on my new bike because I think I sit on it differently - the last bike was a killer! Loved hearing about your history with bikes!! I'm looking at upgrading my push bike to a mountain bike this Christmas so I can keep up with the kids!! I've never had the desire for a mountain bike Kerrie - but if it meant the kids wanted to ride with me, I might have considered one. I really like my upright one where I'm not bent over the handlebars and getting hot and sweaty.